Kindness runs in Blair Israel's blood. As a young girl, Blair and her triplet brothers, Brett and Blake, were told stories about how her grandmother and grandfather took homeless people off the streets and welcomed them into their home in Ohio. They gave them food, water, clothes and sent them on job interviews. "I was inspired by my grandmother's stories, and I decided right then that my life's mission would be to spread good will and improve the lives of others." Now Blair is a senior at Marjory Stoneman Douglas high school who maintains a high GPA, enjoys hanging out with her friends at the pool and loves to run. But between juggling school, athletics and a social life, this 17-year-old still finds time to have over 600 hours of community service and is the founder of the Blair Share Project, a nonprofit organization that collects men's business attire and distributes the clothing to homeless individuals to be worn on job interviews. When Blair's father, Scott Israel, was elected Sheriff of Broward County in November 2012, one of his missions was to work toward improving the lives of the homeless population in his community through the Broward County Sheriff's Homeless Outreach Initiative. One day Blair was accompanying her father on a speaking engagement and heard her father say to the community that the homeless people are not problem people, but rather people with problems. Blair was deeply impacted by this statement and was determined to help. "My dad's initiative aims to help people get off the streets, but I wondered how can people support themselves without jobs, and how can people get jobs if they don't even have clothes for interviews?" And so, the Blair Share Project was born. At first, Blair distributed some flyers she designed throughout her community and started cold-calling some family and friends. "I just asked 'Hi, do you have any suits and ties you don't want anymore? I'm starting a thing," Blair laughs. "At the time it was just an idea." At first only two people returned her phone calls, but within the next few months she was receiving calls every day from people who had heard about her project from their friends and wanted to donate clothes too. "My phone was blowing up!" Blair says. "I eventually had to create a Facebook page dedicated to the project for people to contact me." As it grew, the Blair Share Project quickly turned into a family affair. Blair and her mom drive to pick up clothes from donators, her brother Blake helps to iron the clothes, her brother Brett helps to sort and carry boxes to the car. Together they deliver the clothes to the Partnership for Homeless and JC's recovery house, a sober living community for men suffering and recovering from alcohol and drug addiction. In it's first few months, the Blair Share Project collected approximately 500 suits. After a year, the project has collected around 2,500 suits and over 300 pairs of shoes. The project has also expanded its collections to three counties, Broward, Dade and Palm Beach. 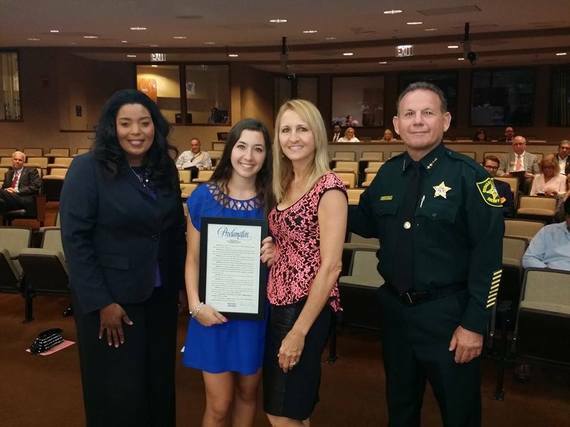 In June, Blair's hard work, dedication and big heart was recognized by the Broward County Mayor, Barbara Sharief, who presented Blair with a Proclamation declaring June 14, 2014 "Blair Israel Appreciation Day." Blair plans to continue working on her project at whichever college she attends in the fall of 2015. She is hoping to attend the University of Florida so she can study the major "Family, Youth and Community Sciences" and bring the project to many homeless shelters in Alachua County. Blair's ultimate goal is to get the Blair Share Project nationally recognized. "There are less fortunate people who need jobs all over the country, "Blair says. "They need our help." For more information or donate to the Blair Share Project, please contact blairlovestank@yahoo.com or visit its Facebook page.